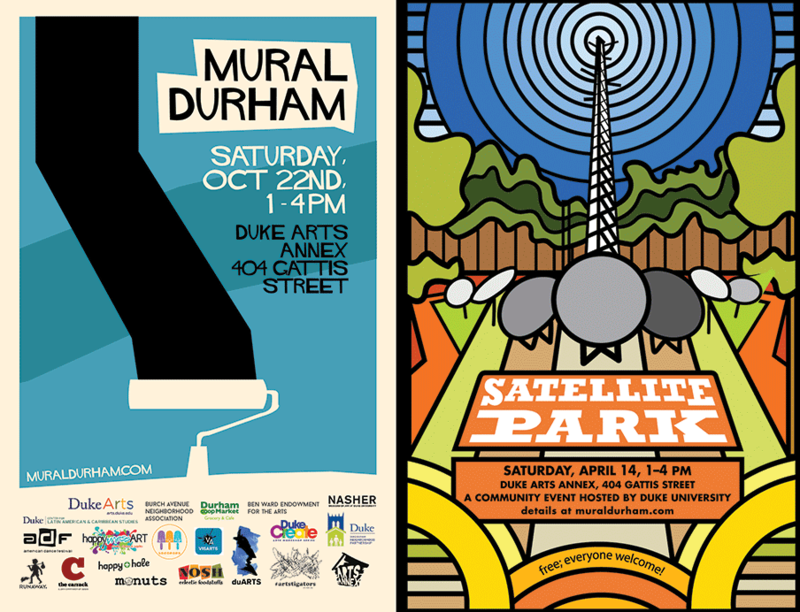 Past Mural Durham festival posters by Duke students Dorothy Feng (T ‘18) and Adair Jones (T ‘19). In October 2016, Duke students presented the first Mural Durham festival at the Duke Arts Annex to bring together the Durham community, artists and students. The Arts Annex is a creative space tucked into the historic Burch Avenue neighborhood, with foundational murals by Mathew Curran completed a year after its opening in 2012. Artists Franco and Brenda Miller Holmes, WOEM and J. Massullo, Heather Gordon, Bart Cusick, Victor Night, and Sergio Sánchez Santamaria transformed the Arts Annex with new murals that were unveiled to the public at the festival. Charlotte McKay (T’17) was the student lead for Mural Durham, and Dorothy Feng (T’18) designed the Mural Durham logo. Collaborators included duARTS, the Burch Avenue Neighborhood Association, Duke Arts, DUUVisArts, Duke UCAE, and #artstigators. The Nasher Museum of Art at Duke University collaborated with Preservation Durham, the Museum of Durham History, and Bike Durham to develop a mural bike tour following its commission of Time Bridge by Odili Donald Odita on the Downtown Durham YMCA in 2015 (part of Nasher10, a celebration of the museum’s first decade). As new murals appeared, and others were destroyed, partners came together to develop an online archive expanding upon this bike tour. In 2018, Mural Durham celebrated the opening of Satellite Park at the Duke Arts Annex. Eight decommissioned satellites, which delivered educational programming for Duke Cable Television in the 1990s, were transformed by local artists Julienne Alexander, Bethany Bash, Sarahlaine Calva, Cornelio Campos, Gina Franco, Rachel Goodwin, J Massullo, and George Mitchell (with HappymessART/ArtPost). In order to continue to grow the online archive and to develop tools to support new public art, Mural Durham partnered with the City of Durham’s Public Art Program in 2018. Later that year, a Mural Finder featuring 26 murals was published with support from Discover Durham and Duke-Durham Neighborhood Partnership. Mural Durham connects Durham through creativity, one mural at a time. Together, we envision the day when Mural Durham can evolve into an independent non-profit that provides funding to elevate community-oriented public art in our city. Header: Mural Durham: Satellite Park festival at the Duke Arts Annex in April 2018. Photo by Jared Lazarus.